YISEVEN gloves are the epitome of elegance meeting functionality. The combination of manufacture expertise and contemporary style is what makes YISEVEN gloves exclusive. YISEVEN creates fine crafted gloves of extraordinary beauty, durability and functionality. YISEVEN gloves are made with high quality genuine leather. They are crafted with fine leathers that are resistant, flexible, breathable, and that will hold their shape after wearing. YISEVEN offers an array of modern and traditional gloves. Our stylish sophisticated gloves are suitable for everyday wear as well as special occasions. These leather gloves go beyond the typical thumb & index finger touch compatibility. The entire palm & all fingers are touch screen compatible, meaning you don't have to remove your gloves to use your touchscreen device when keeping warm. Size Chart: Please refer to our size chart picture to find the appropriate pair of gloves. *Note: these gloves are designed to tightly fit your hands, so you might find difficult first time put your hands in. It is normal. The extensibility of leather will shape it to perfectly and comfortably fit your hand after wearing a few days. In case you look for a comfortable fit from the beginning, we suggest you to go up for one size. Customer satisfaction is our mission. YISEVEN is here to provide our esteemed customers a most pleasant experience. If, for any reason, you are unhappy with your purchase, we will offer a REPLACEMENT or REFUND immediately! 100% A-CLASS LEATHER - Made of high-quality authentic Leather with softness of touch, suppleness, strength and lasting comfort. The leather gloves fit your fingers well and would be your chic Cold Weather essentials. FASHIONABLE DESIGN - These gloves have a classical yet fashion design, thus they are suitable for everyday wear as well as special occasions such as dining, party, and especially good for driving - not only does it assist with grip, but is also helps maintain the steering wheel and shift knobs. HIGHER QUALITY AND DURABLE - These gloves are fashionable and good looking. Also, they are Hand Made by using very high quality lambskin leather for long-lasting usage, which will certainly add something to your personal style that others will notice. RELEX GLOVE SIZES - To determine your size, you basically measure around your dominant hand, excluding your thumb. The measurement in inches is your glove size. If you measure in centimeters, you have to divide the measurement by 2.54 to determine your glove size. BUY NOW WORRY FREE! - Customer satisfaction is our mission. If, for any reason, you are unhappy with your purchase, we will offer a Replacement or Refund immediately! If you have any questions about this product by YISEVEN, contact us by completing and submitting the form below. If you are looking for a specif part number, please include it with your message. 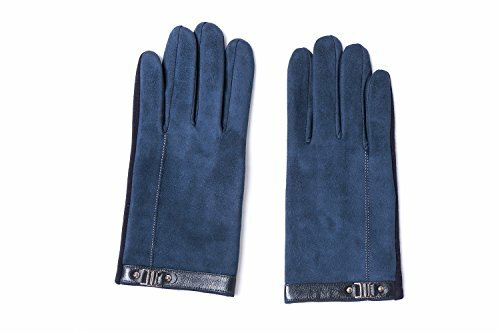 YISEVEN Men's Goatskin Winter Gloves, Fashion Lattice Style, Touchscreen Technology,Black,8.5"